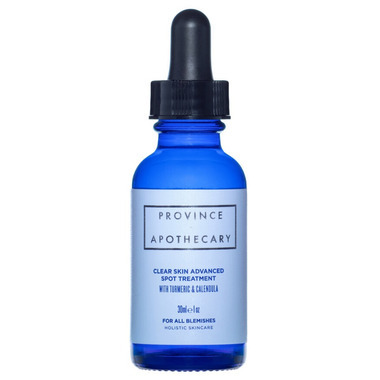 No two blemishes are the same - that’s why Province Apothecary has developed a treatment effectively formulated for all kinds of blemishes, especially cystic blemishes. Featuring powerful organic Turmeric, this blend of exceptional plant botanicals calms even deep-rooted inflammations. One drop is all you need to dramatically minimize the appearance and lifespan of imperfections, restoring your skin’s natural glow. Organic Turmeric is a powerful and gentle herb that naturally restores and calms skin. Exceptionally rich in antioxidants, turmeric is anti-inflammatory, antiseptic and antibacterial, making it ideal for treating acne. Organic Calendula Extract naturally heals and regenerates. Calendula gently cools and nourishes damaged skin. It assists in cell growth and tissue renewal, treating skin inflammations, scars, wounds, rashes and acne. Organic Gotu Kola increases collagen production and blood flow to boost skin’s natural healing ability, while Organic Plantain delivers essential nutrients to the skin. How to use: Apply once a day only. Place one drop on inflamed areas. Wait 2-5 mins for it to absorb.